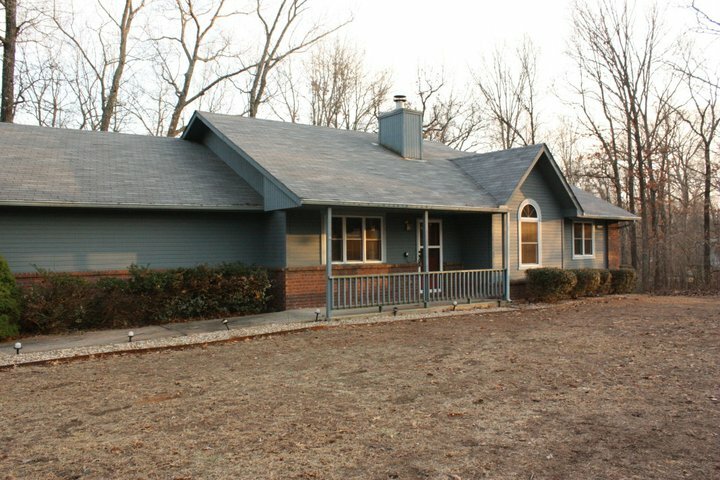 Since I started this blog after I bought, flipped, and sold Flip #1, I didn’t really progress most of the projects like I have on my last two flips. I’ve had some people ask for some better before and after pics of that flip. 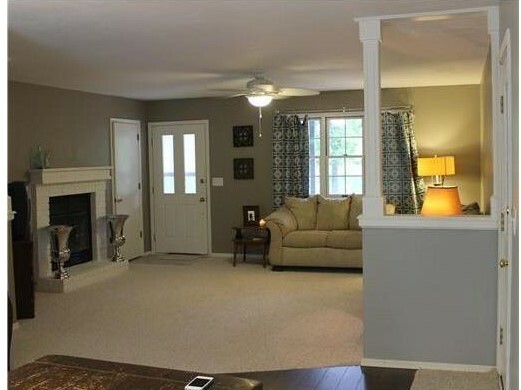 It’s always fun for me to go down memory lane on my flips- I get to see projects I forgot about, paint colors I want to reuse, scary/frustrating moments I don’t want to relive, and all the other things that come with a house-flipping life. When I first bought Flip #1, I had no idea I’d be buying a lifestyle. I also had no idea what I was doing. I just knew what I could afford (not much), and I knew I had a vision. Everything in between was all blur to me! 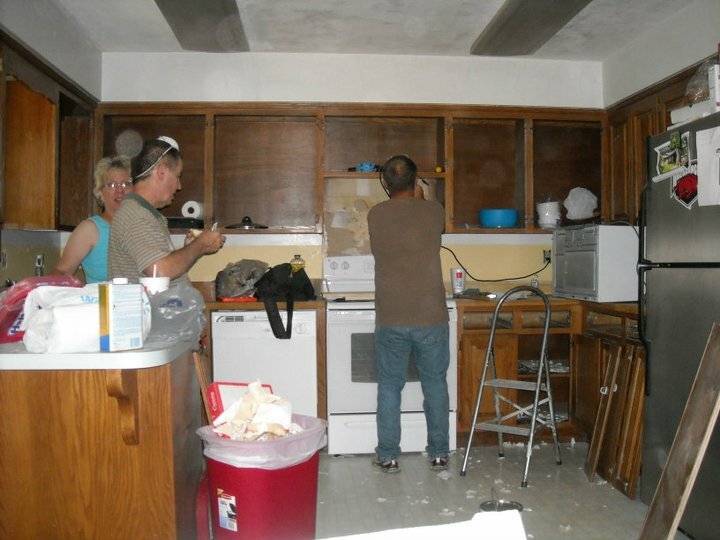 The dated foreclosure that I purchased had been badly neglected. 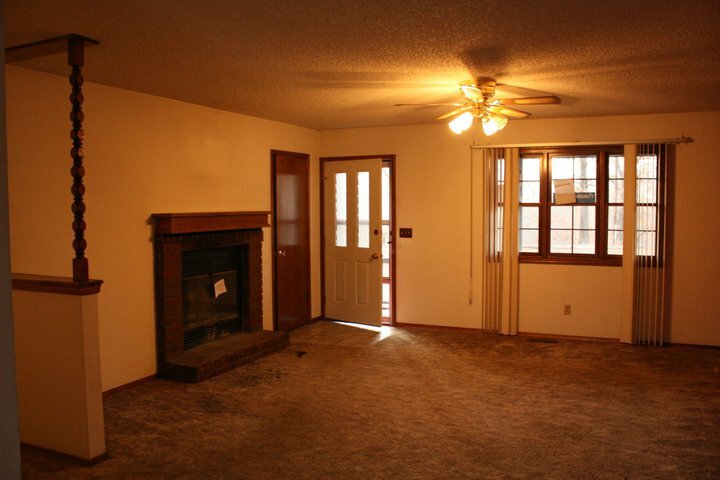 It literally had massive burn holes in the filthy carpet, dirt on the walls, & grimy appliances. I knew it needed a lot of work, and I wasn’t afraid of work. I just don’t think I realized what living in a construction zone would be like! While I’m now totally used to living in complete chaos, it was a bit of a shock for me initially. The house had such good bones. 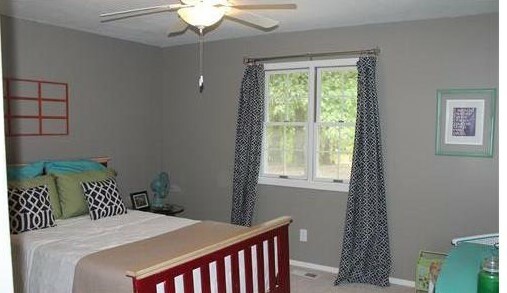 TONS of storage, quiet location, and good square footage size. 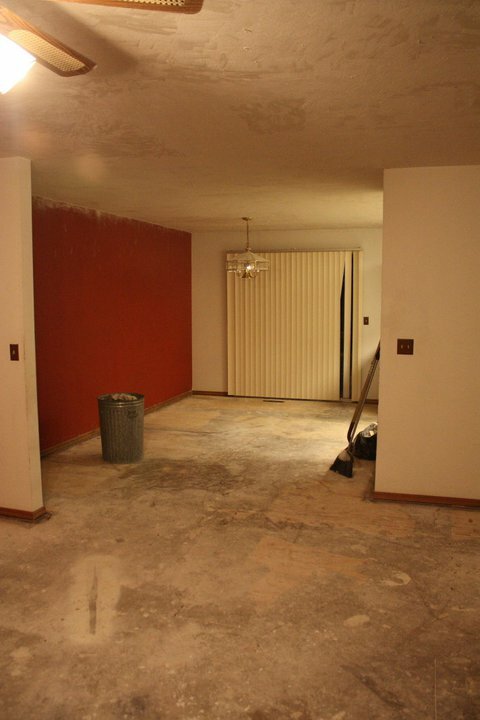 Plus, since it was a foreclosure, I got it at a great deal– essential in the house flipping business! There hadn’t been a single update since the house was built. 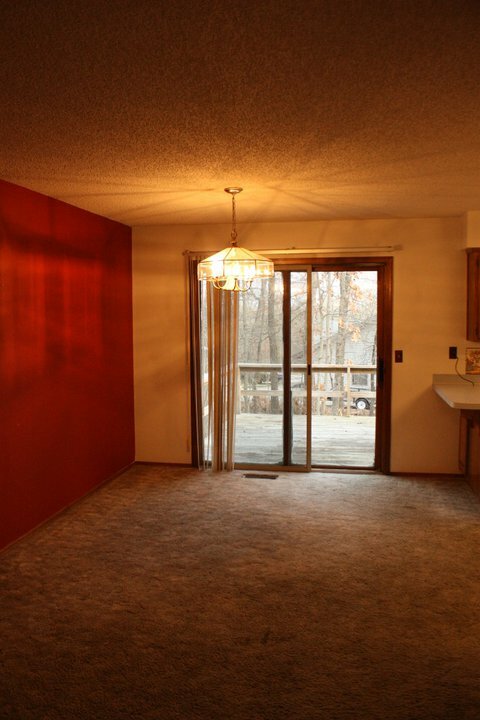 The walls were the original blood red, the dated patriotic wallpaper cursed the entire house, and the carpet had not be cleaned or cared for…ever! 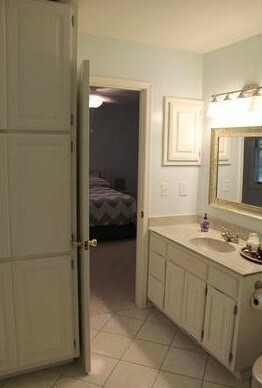 This three bedroom, 2 bath house was cute, though. 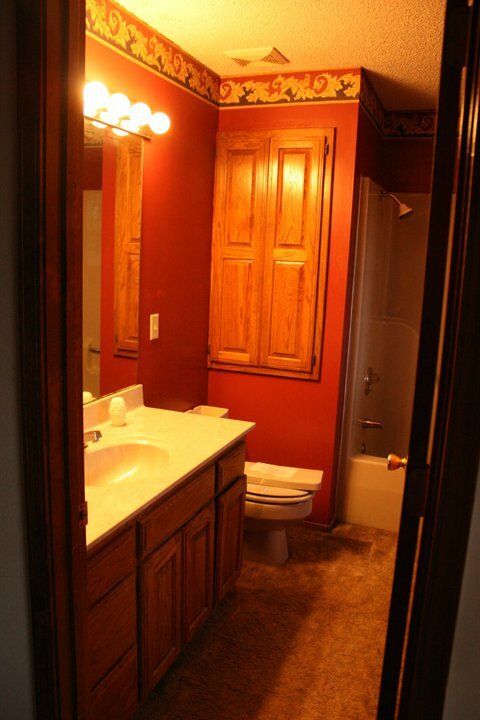 The bathrooms were large with lots of storage. 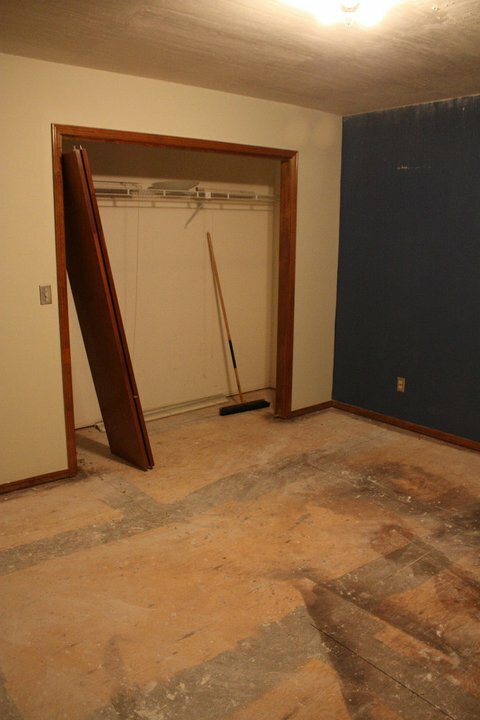 Unfortunately, the filthy carpet covered almost every square inch in the house…including the bathrooms! As did the blood red walls. There was very little that I left as-is. From day one, I started gutting it. And I do mean gutting. Destruction is always my favorite part of a flip anyway! 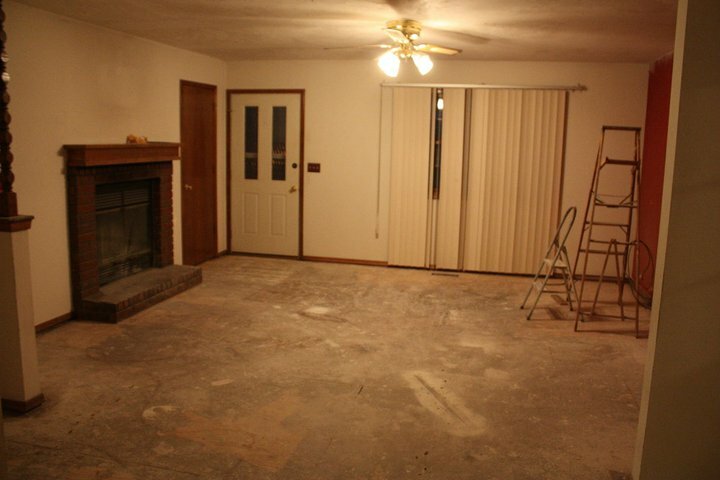 The first order of business was removing the awful carpet and hand-scraping the popcorn ceilings. File under Things I’ve Learned, there are much easier ways to scrape popcorn now days, but with the help of some friends, we hand scraped every square inch of those ceilings. I recruited family to help take apart my cabinets. As always, the demo goes quickly! Busting tile, ripping carpet, hand scraping cabinets, it all goes pretty quickly. 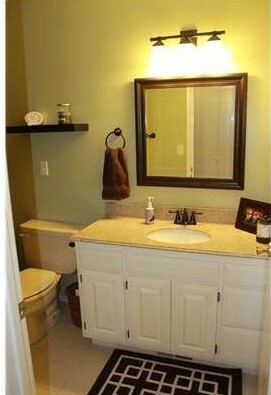 It requires a lot of elbow grease and motivation, but it’s always what makes the most drastic change in a house. 1. I barely had money to buy a house, so I was saving up for the remodel. 2. I knew I had to live there at least 2 years for tax purposes, so I wasn’t in a huge rush. 3. I had nobody to help me, and I didn’t know a thing about anything. 4. I really felt like I had no clue what I was doing. The hardest part was that all I had was my bed. That’s it. So I’d get up in the mornings, shower and then immediately put on flip-flops to walk across dusty subflooring to find clothes in a suitcase and get ready in the morning. To think about it now, I must have been crazy. But at the time, I just so wanted to own my own place and make a good investment that it was worth it. In hindsight, yeah, it was worth it. It just sucked a lot. 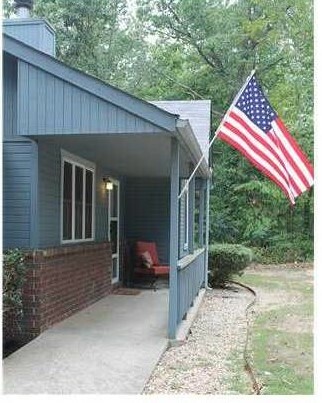 But two years later and for less than $10,000, I had a house that looked totally different from the day I bought it. I brought in character and charm on a shoe-string budget. Every flip I do is champagne taste on a beer budget, and despite what people tell you, it is possible to transform a house with DIY projects and a tight budget. It takes creativity, restraint, research, and patience. But on closing day, it’s always worth it. People have asked if I attended a house-flipping conference (no, they’re a money scam. Don’t do it- FYI). So then how and why? The how is that I grew up with a Dad that owned a real estate business. From the time I could walk, probably before then, I was at house showings, construction sites, rentals, house-flips, etc. It just became part of my DNA. The why is because of student loans. I have found no other method of paying off substantial amounts in one payment than through house-flipping. 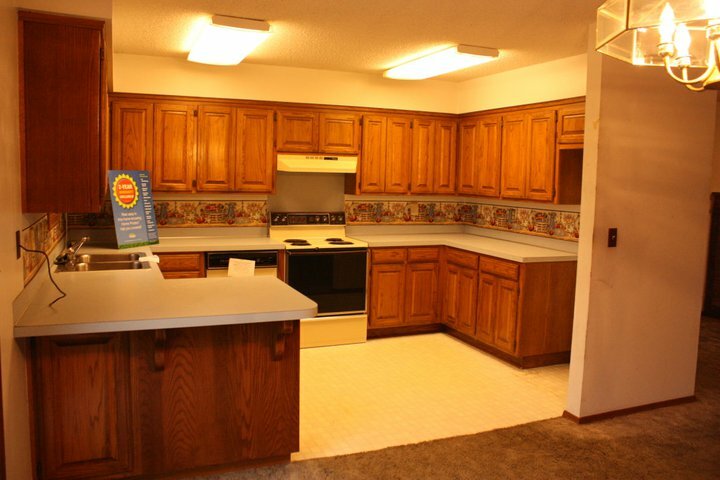 The tax benefit of flipping a house that you live in is that you get the profits TAX FREE. You don’t have to pay to go to a house-flipping conference to know that. In the narrow definition of house flipping, I am not a house flipper because I live in the property for 2 years. In order for me to be a technical house flipper, I would need to flip investment properties, not my primary residence. But I choose to flip my primary residence because I want as much of the proceeds to go to my student loans as possible. So, yes, that means I move every two years. Yes, that’s crazy. But I’m totally used to it by now. There was so much I didn’t know. Even more that I didn’t know that I didn’t know. I made some mistakes. I learned a lot. I utilized every possible resource- bribing free labor with pizza, begging friends and family to help, YouTube, Pinterest, HGTV, etc. I left no stone unturned when trying to teach myself as much as I could. I wanted to know as much as I could so I could avoid labor costs. I typically would take an expensive inspiration and then shop thrift stores, estate sales, or auctions and find a cheap alternative to my inspiration. 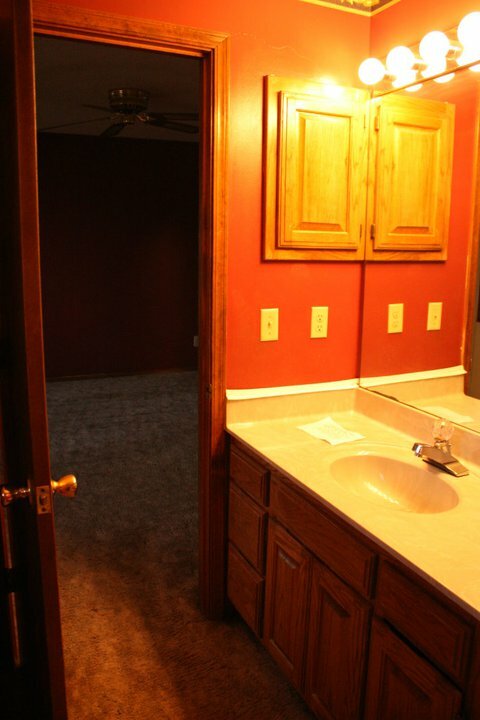 In this flip I spent $10,000. That’s it. In Flip #2, I spent almost $10,000 just on the floors. So budgets vary. 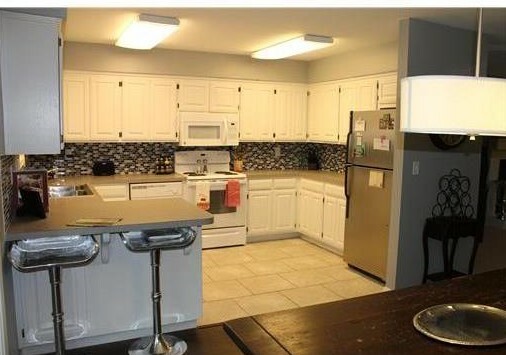 The price point of Flip #1 was literally HALF of Flip #2, so my budget dramatically increased. The financial side of house flipping is not my favorite- unless it’s the check I get at closing, but it’s the most important. I watch every.single.dime I spend. I confront contractors about absurd prices, I buy used, I shop clearance, I repurpose, I do whatever I can to reduce my overall budget and increase my overall profit. Recently, I drove by Flip #1. It’s been three years since I sold it and five years since I bought it. On the day I drove by, the owners had their windows open, puppies playing in the yard, and they were all enjoying the beautiful day. I absolutely love that they bought a house they can enjoy because of all of my hard work. It was definitely worth it in the end. So, in the end, it was trial by fire. It was fun. It was crazy. I cursed a lot. I enjoyed it. And clearly, I’d do it all over again in a heartbeat. I love this crazy house-flipping life I live. Wow. I think you were hugely brave on your first flip… also so hardworking, persistant (and great with dealing with contractors). Congratulations, you deserve every success that comes your way. Wishing you continued success. I love what your doing . What a great house. It’s always true that the final result is worth (usually) all the torment you have to go through. I will love to follow your flipping adventures and wish I could be that brave.